[ARCHIVED THREAD] - Forget the Glock Carbine that will never happen...I want an XD carbine! Maybe SA will get us a high quality carbine since most have given up on Glock. That is an interesting thought but I already have a carbine that I like. It is an inch shorter than a AK as well. I have never been a big fan of pistol caliber carbines. I like the thought of being able to reach out and touch at 200 yards as well as at 20 yards. I wouldn't want a pistol caliber carbine in place of a real rifle....but I own a number of guns that don't really serve a purpose...just fun. Too true. Like the "pistol caliber" M1 Carbine I am looking to get from the CMP. I would love to have a pistol caliber carbine but only in 10mm. Hey JohnRippert what are the specs on that middys barrel? CMMG mid-length gov profile 14.5 w/ perm Phantom, 1in7 twist, chrome chamber and bore. What's wrong with the Glock carbine setups? I heard they are pretty accurate. I am referring to the Infamous Glock carbine that they haven't built...all factory setup that all of us have been wishing and hoping for, for the last 20 years. I am just saying that now-a-days I am more into the Springfield XD and would love to see a factory XD carbine. I wish the Kel Tec Sub 2000 was designed to take XD mags instead of Glock mags. It would be even better if they chambered it for .45ACP. I bet a real winner would be a Mini 14/30... in, say, .45, 9mm, .40, most any pistol caliber. You can add me to that list. I'd love a KT in 9mm to function as a portable long gun for vehicle use/storage. Rather have something in a rifle caliber but I wouldn't want to leave it there. Just get some company to make new inter-changable grip sleaves for the Beretta Storm. 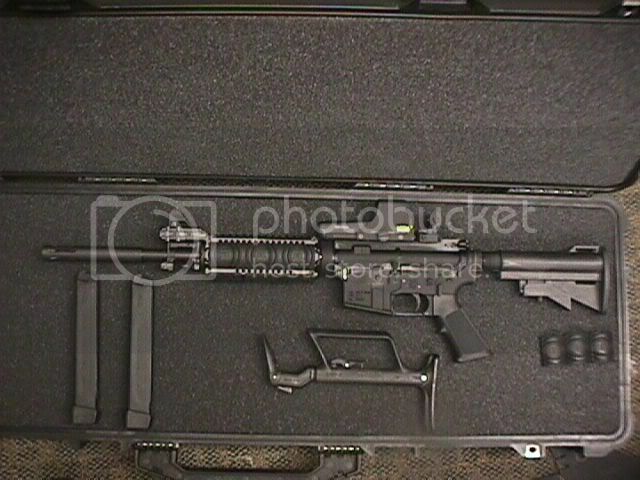 Its exactly what I want in a pistol caliber carbine, but doesn't have a wide range of mag options. One the huge benefit of pistol caliber carbines is mag interchangability with your pistol. If they made one in 10mm with at least 15rd mags I would get one in a heart beat. They could do so much more with that firearm in the stock and grip area that would make it even better. Not that it's what you all are looking for, but Olympic has produced it's line of pistol caliber AR platforms that are designed to accept Glock Mags. We use them in our Active Shooter Response Officer's cars. I would be ALL OVER a Beretta Storm if I could use my Glock mags in it. As it is, one is on my wish list, but it's down there, because I like mag\ammo commonality. I'll eventually get one in 9mm, but if I could get one that would accept my G19 mags, I'd buy it today.